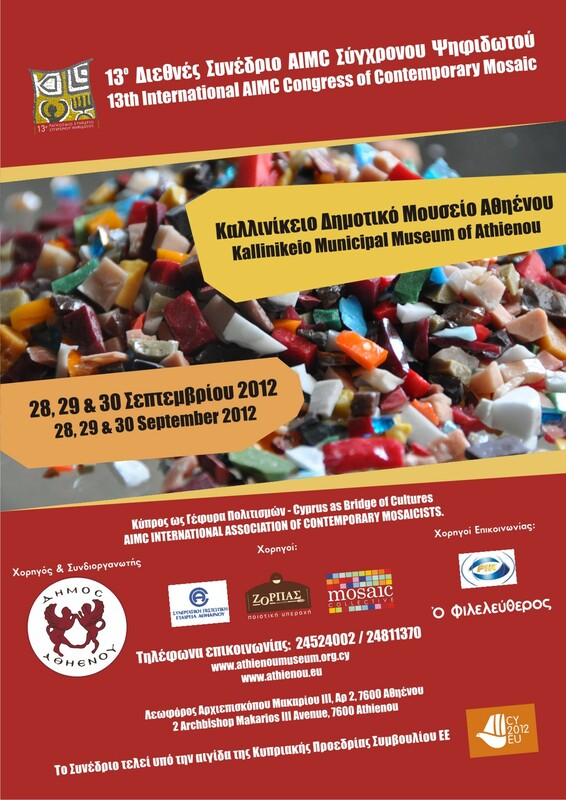 Once again one and half years are over since the last 12th International AIMC congress of Contemporary Mosaic took place in Athens. Now we are going to prepare intensively the next conference in Cyprus offered by Mrs. Soula Christou of the Collective Mosaic Group in Limassol to the General Assembly at the last meeting in Athens. This proposal found a unanimous joyous agreement by the present members of the AIMC. Once more we shall come in a country with a strong ancient Greek and Byzantine heritage whose monuments we can see and admire especially at the planed sightseeing tour. But the admiration of these old relics are one thing, the main task however for us should be the presentation of contemporary mosaic works. 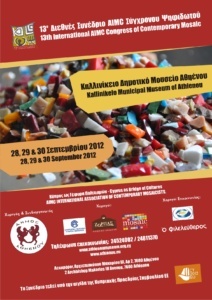 From the 28th to the 30th of September 2012 the AIMC’s International Congress took place in the city of Athienou, Cyprus, at the Congress Palace of the city (also known as Callinikeio’s Museum), under the executive presidency of Soula Christou. More than one hundred and twenty people attended the event; among them artists, archaeologists, experts of Mosaic and Cypriot school teachers. During the 3-day- Congress, 36 speakers presented their works. The scene was dominated by: the works of the Contemporary Mosaic artists, the mosaics presented at the second edition of “Ravenna Mosaico”, the mosaics exposed at the “First International Prize for Young Artists and Mosaic of Ravenna”, the themes based on the ancient mosaics of the Island, and, last but not least, the educational programs followed by Cypriot Schools. Whilst Congress works took place, Cyprus also had the greatest pleasure of hosting a Mosaic Exhibition, joined by several artists coming from all over the world. During AIMC’s General Assembly, which followed the Congress, the Chairman of the Association, Mr. Manfred Hoehn, resigned from presidency, after having held this position for 12 years; he moreover presented a final report through which he focussed on the highlights of all the activities that were carried out during his chairmanship. The Chairman himself, as well as showing great satisfaction for Cyprus’ Congress of Mosaicists, enthusiastically approved the election of Nikos Tolis as AIMC’s new Chairman. Mr. Tolis is Greek, and comes from Athens; he is an accomplished mosaicist and studied in the city of Ravenna, Italy, for a very long period during which he considerably deepened the knowledge of the Italian language. Besides that, Nikos was the executive President of the last Congress held in Athens, a role for which he gained much acclaim. Finally, by the initiative of Soula Christou to organise the Congress in Cyprus and by the significant number of local artists and academics who participated, it became obvious the interest for the mosaic art in the Island, an interest which increases constantly the last years. We wish to sincerely thank all the people who got involved in the whole organizational process for their efforts, as well as for their warm hospitality!